BULL•SHOT™ is the Gremlin’s unique BULLet shaped split shot. It’s the easy, effective way to add a little weedless weight to your line. BULL•SHOT™ works great for finesse fishing or split shottin’. It’s as easy to use as our good, old Split Shot and as weedless as any slip sinker. Like our Split Shot, BULL•SHOT™ is made from squeezable soft lead and has an S-curved jaw that grips the line without damage. Squeeze it on with your fingers and pry it open with a thumbnail. No tools or teeth needed. Sizes shown: #0, #1, #2, #3, #4, #5 and #7. 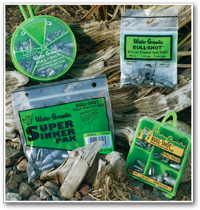 BULL•SHOT™ is available in Fry Pan Selector, Pro Pack, Zip-Lips and Super Paks.